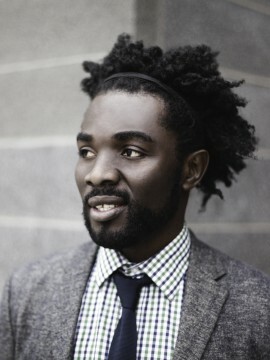 Congratulations to PHANUEL ANTWI who was a runner-up in the 2018 Canadian Art Writing Prize! The Canadian Art Writing Prize is an annual juried prize designed to encourage new writers on contemporary art. To be considered, applicants submitted an unpublished writing sample on an art-related subject. Phanuel Antwi’s essay, “A Felt Sense of Whether,” interprets artist Lesley Loksi Chan’s 2017 exhibition, ‘According to: WHETHER,’ using Chan’s textile practice to connect to a more textured nature of movement—political movement, gender and #MeToo—while speaking within and against the language of aesthetic representation. “Antwi’s writing requires of the reader that we acknowledge and reckon with the complexities that lie within our own bodies, and how we carry this into the world [in which] we live, work and make art. Drawing on philosophy, art history and theory, Antwi convincingly complicates and argues for an engagement of difference in contemporary culture. Antwi positions artistic production as a practice that is not only materially expansive, but one that is intimately and deeply committed to and part of a much wider community.” –Bopha Chhay, 2018 jury, Vancouver-based writer and curator.